Friends, this Puppy Chow Chex Mix almost was the end of me. Well, these photos are the BEST one’s I was able to pull out of over 100 shot in a three day period. Trust me when I say, Puppy Chow Chex Mix is a son of a gun to photograph!! Nevertheless, the recipe was also SO good I couldn’t just throw it in the pile of “yucky” that many other delightful creations have ended because I can’t get the right shot. 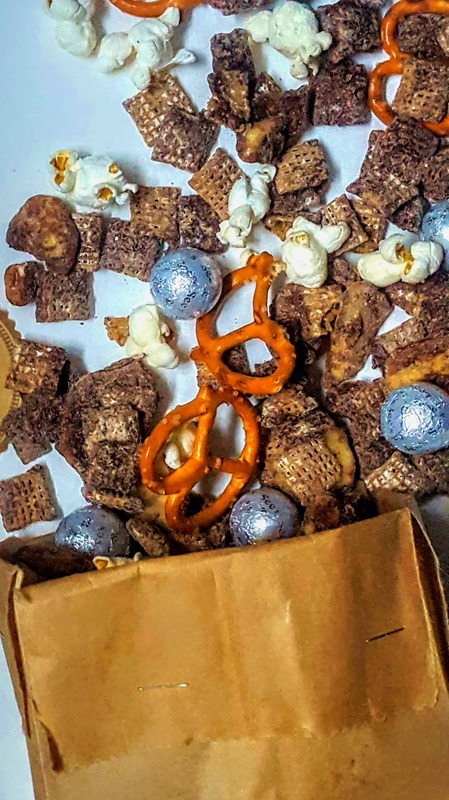 Thus, take it or leave it, but this Puppy Chow Chex Mix instantly became a favorite in my house, despite its poor appearance. Oh, I added banana chips, and I promise you when I say it took this to a whole new level! To be honest, I came up with the idea when walking through the market and saw them on the corner isle. 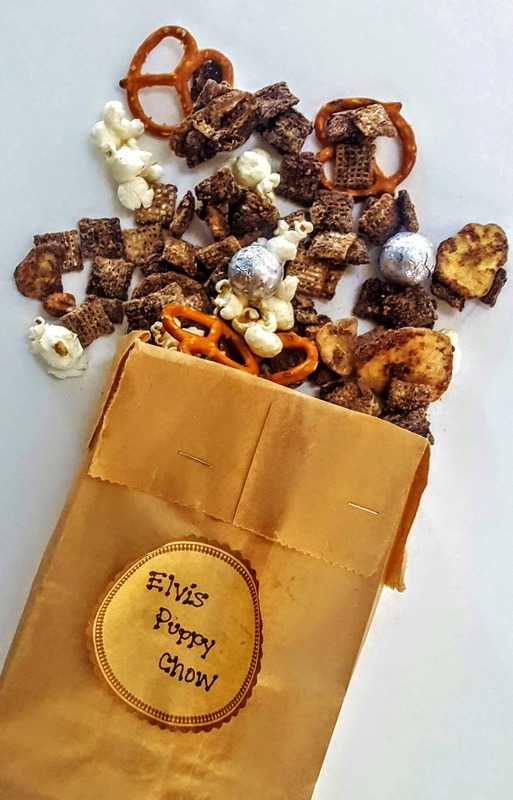 I knew how much my mom LOVES banana chips so thought I’d through the extra twist in for those other Elvis fans too! Now, what makes this #shawsimpleswap approved? First, I used nearly 25% of the sugar usually added to a traditional puppy chow! Instead, I mixed the powdered sugar with powdered cocoa peanut butter to give it a touch of sweetness without going overboard. And, an added bonus, the powdered cocoa peanut butter also packs protein and fiber, too! And, the final touch, lots and lots, I mean lots, of LOVE! Seriously, when giving foodie gifts, the magic touch truly is putting all of your heart and soul into it! Mr.CEO always says he can taste the love in my food, and I truly think it’s because I cook with my heart, sometimes my mind, but always passoin as my fuel. Thus, put your heart into it and I promise you, this Puppy Chow Chex Mix will easily be a favorite amongst your friends too! 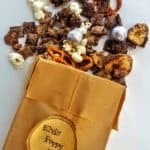 Puppy Chow Chex Mix makes the perfect foodie gift and is ready in no time! Plus, it's filled with whole grains, fiber, protein and lots of love! 1 cup unsweetened banana chips 1/2 cup more if you prefer a banana in every bite! Melt dark chocolate chips over a double broiler or in the microwave. Chocolate should be smooth and pour easily. 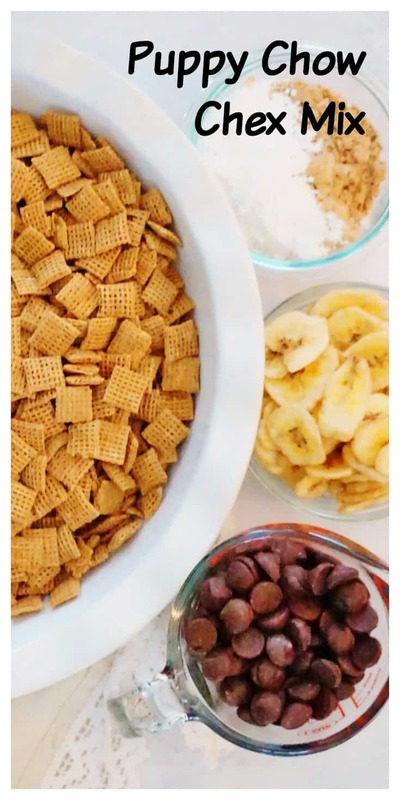 In a large bowl, add the chex mix and pour dark chocolate over the top. Immediately sprinkle the powdered cocoa peanut butter and optional powdered sugar over the top until fully coated. 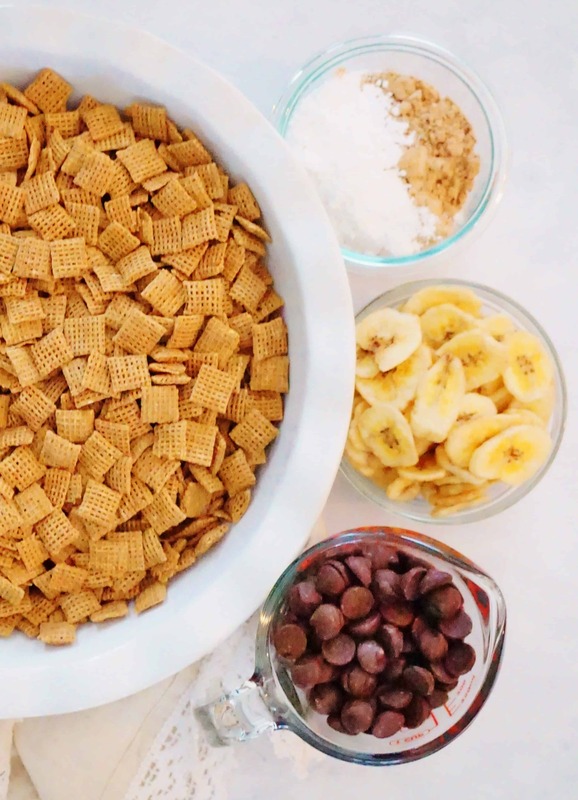 Using a spatula, mix together until all chex mix is coated with the chocolate and powdered cocoa peanut butter and powdered sugar. Add in the banana chips and mix again. Spread on a large baking sheet lined with wax paper and let cool in the refrigerator for up to 1 hour. Remove and portion into tins, bags or jars and gift or store! Best when consumed within 7 days. Store in a cool place! SImple and yummy, Like the sound of that! Ha, me too! So easy I promise you! Love this! Looks so festive. There is only one problem with this recipe, I will want to eat the whole batch myself. Looks GREAT. OMG OMG OMG what!?! Oh I am SO pinning this. How did you know puppy chow is my weakness. This is such a fun spin on it! WOOHOO! I love it when people have the same joy I do with puppy chow!